Pasta is a great quick and easy weeknight meal. The best part of this easy meal is always the sauce. The sauce wins the meal, every time. 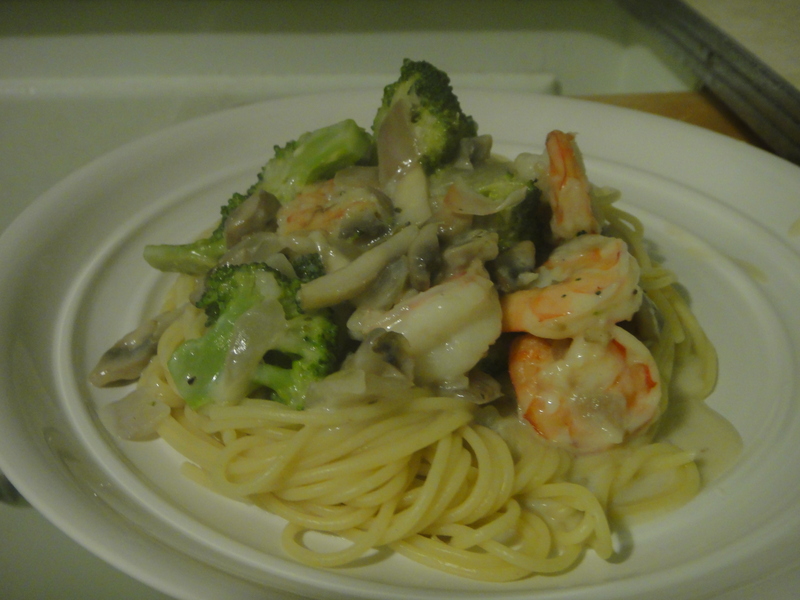 Creamy pasta as my favorite. 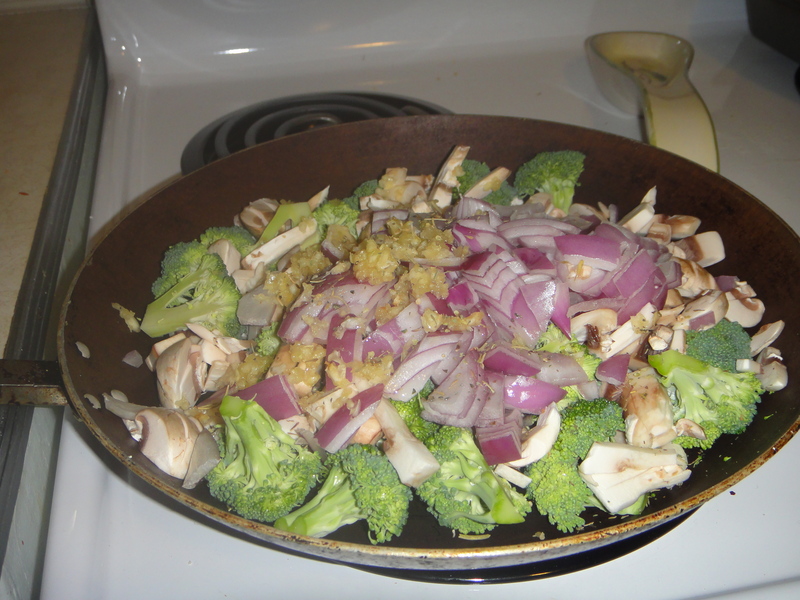 For this recipe, I used Broccoli, Red Onion, Mushrooms and Garlic. I thawed some tiger shrimp and added them to the veggie mixture. Cook them all up together. 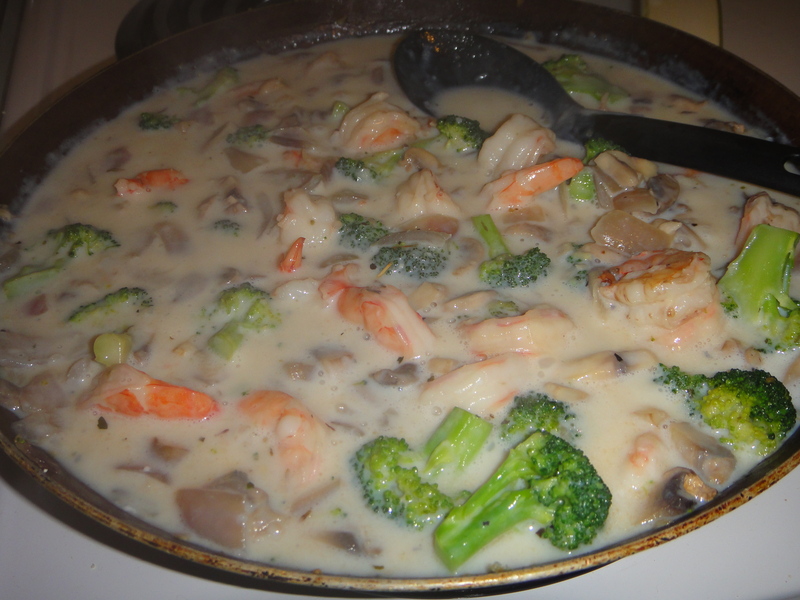 Then add some milk to the pan for the cream sauce base. Boil up some of your favourite pasta and enjoy! Chop and combine veggies in a frying pan. Add a little cooking oil and garlic and saute. 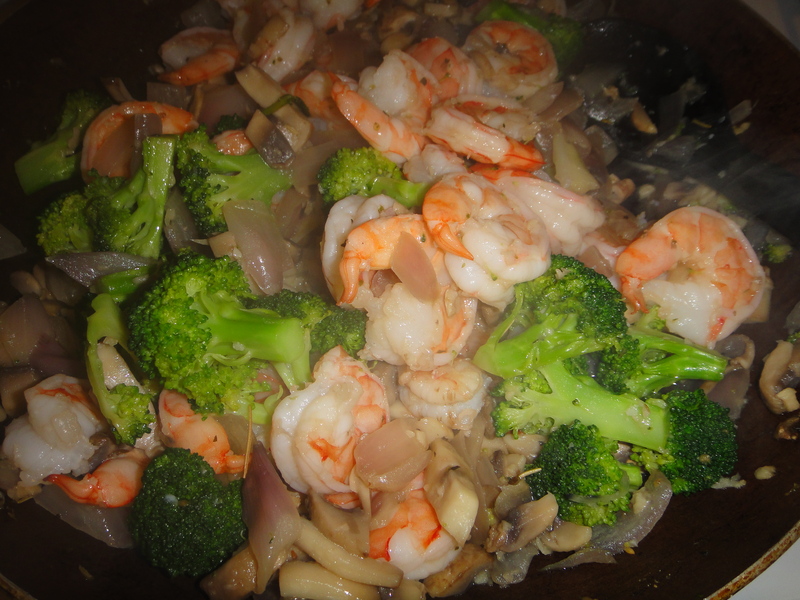 Add shrimp and cook until pink. Add milk and let simmer. Combine cornstarch with a small amount of warm water until dissolved, then add to sauce. Boil until it thickens. Cook pasta and serve together. Enjoy! It’s getting to be that time of winter where you want to eat warm-themed foods, like curries and tacos. Last night’s was Fish Tacos. I used a “pre-seasoned” filet, because that was all I had in my freezer. 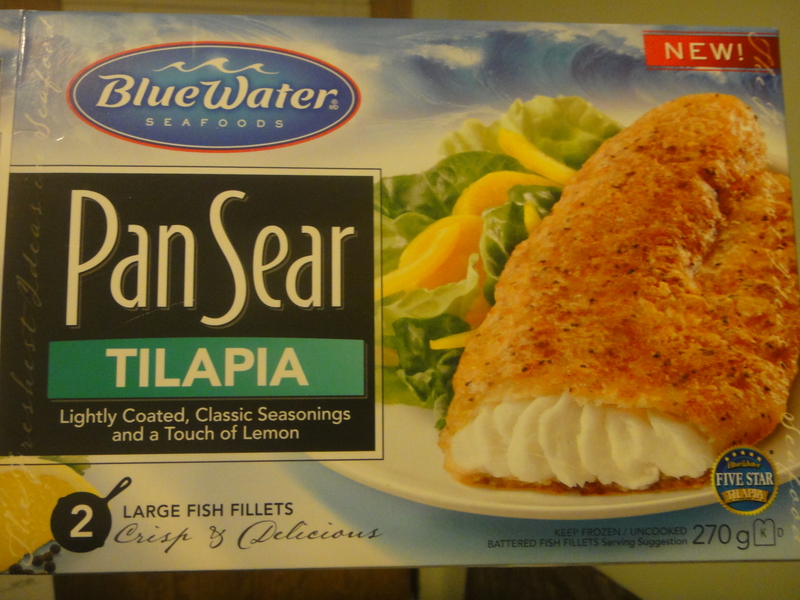 Really, you could have used a plain frozen filet of any type of white fish for this recipe. Cook from frozen on a non stick skillet. I always find the best part of tacos are the veggies. 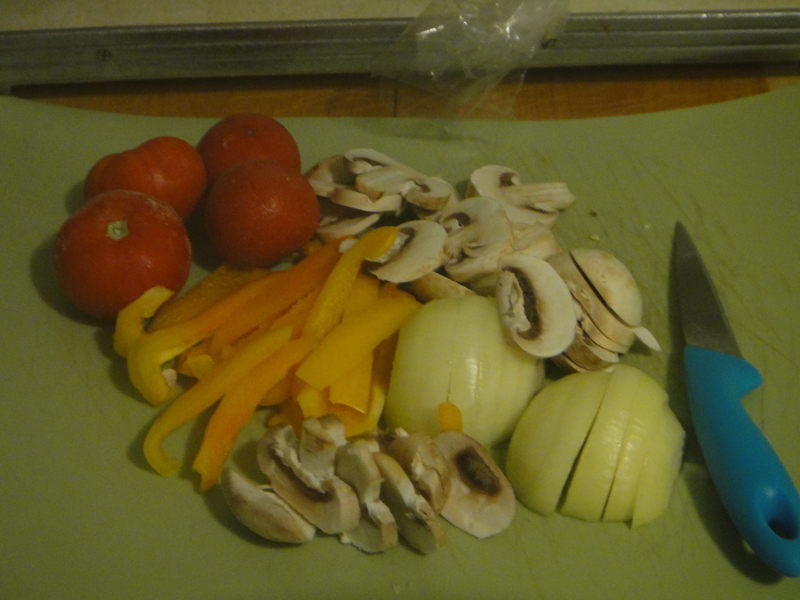 We used yellow sweet peppers, onions, mushrooms and 4 frozen tomatoes from the garden. The tomatoes added the best kick to the recipe. Seasoning the veggies was very easy and delicious. 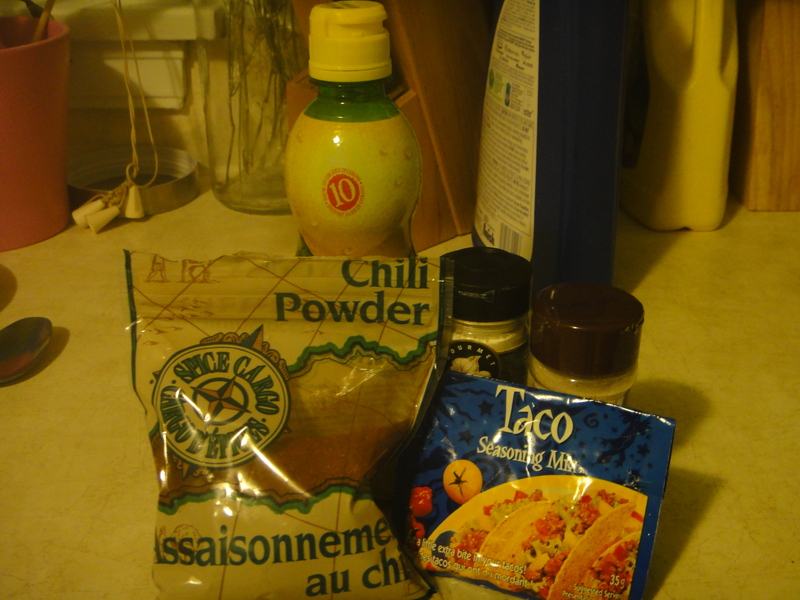 I used chili powder, garlic and onion powder, a tiny bit of taco seasoning mix, and lemon juice. Yummy! 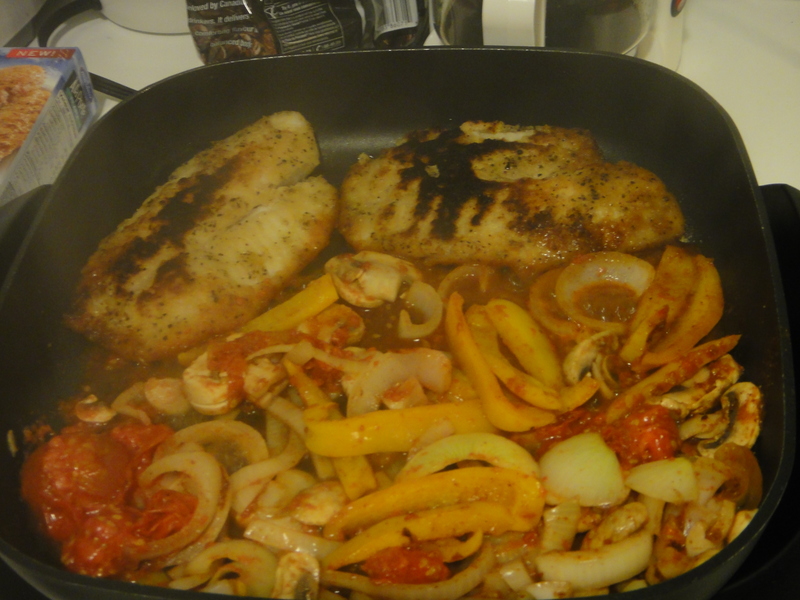 Throw it all in the skillet with the fish and cook until the veggies are tender. My favourite part was squishing the tomatoes once they thawed, releasing a lot of fresh, classic Mexican flavour. Serve on a whole wheat tortilla with lettuce, cheese, avocado and sour cream. 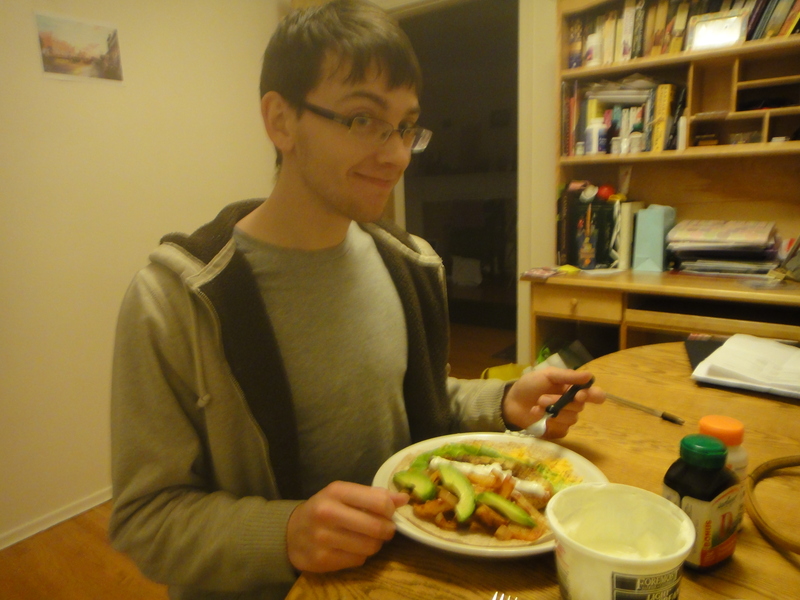 Justin, ready to enjoy his massive fish taco. 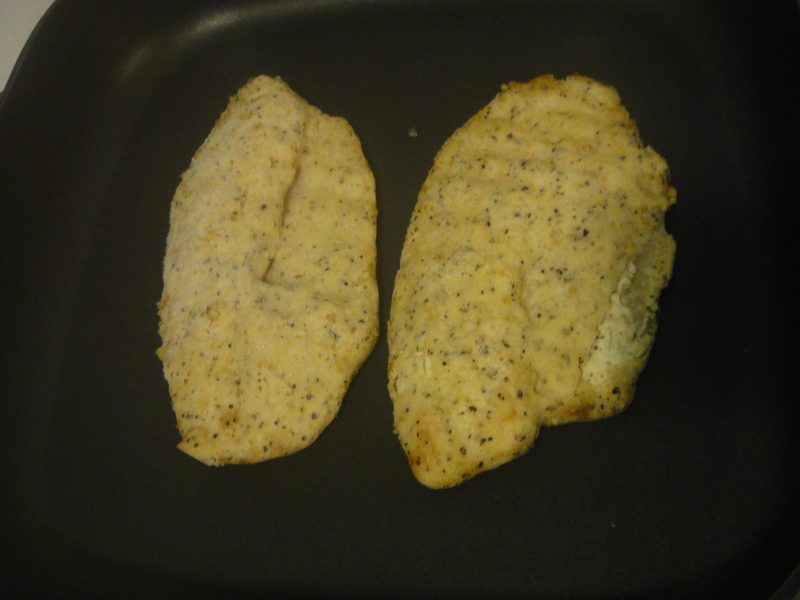 Two Tilapia Fillets, seasoned or unseasoned. Whole wheat tortilla, sour cream, avocado, cheese and lettuce, for serving. Cook fish from frozen on a non-stick skillet. While cooking, chop veggies. 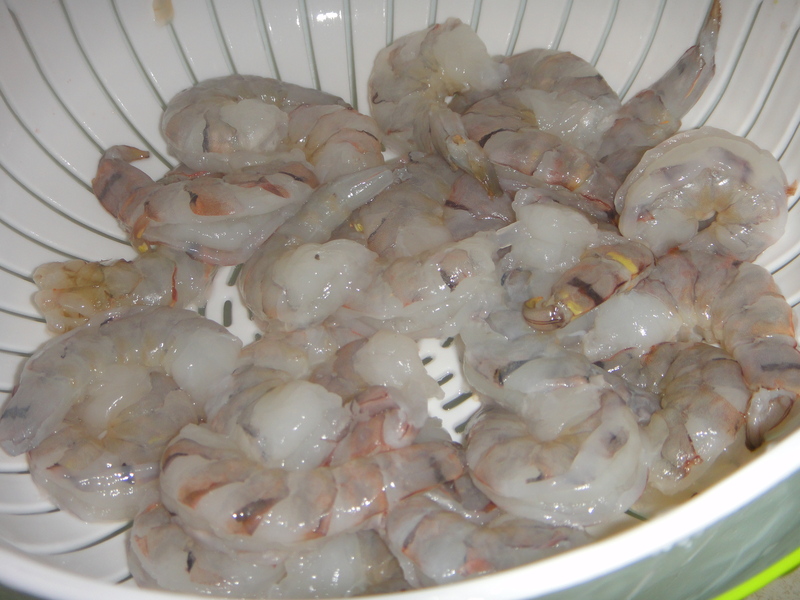 Add them to the skillet with the fish. Add seasoning and cook until tender, letting the frozen tomatoes explode and coat other veggies with their tasty flavour. 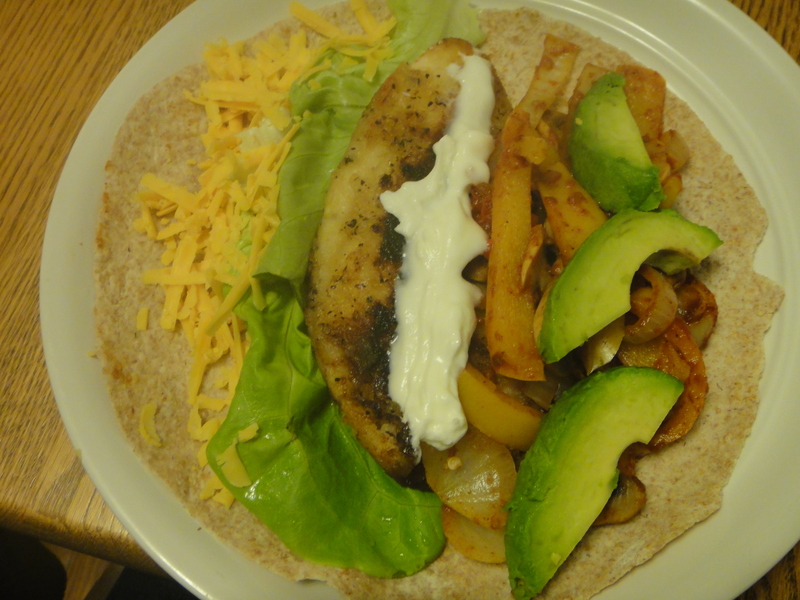 Serve in a warm whole wheat tortilla, with sour cream, cheese, lettuce and avocado. I love the happy camel. They are a Mediterranean Pita Bakery and Deli in West Edmonton. I freely admit that I have a wicked Happy Camel Addiction. Justin and I can sit down and eat a tub of Labaneh in about 20 minutes. It’s just that good. Today, I’m going to feature their newest and most interesting invention. Corn Pita Bread for those Gluten Free fans out there. This pita harkens back to their other amazing bread products, without leaving any of the authentic Mediterranean taste behind. I was expecting them to taste a little bit like a tortilla. No sir. 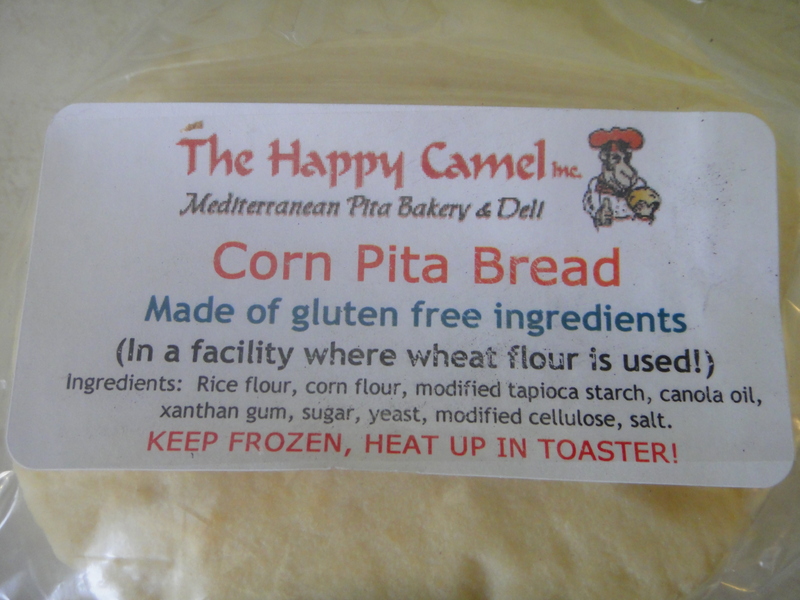 They kept their amazing Happy Camel Pita taste, all while being Gluten Free! They are made in the same facility as their other pitas, leaving some possibility of cross contamination, but all in all, these pitas are pretty safe for Gluten Free lovers. 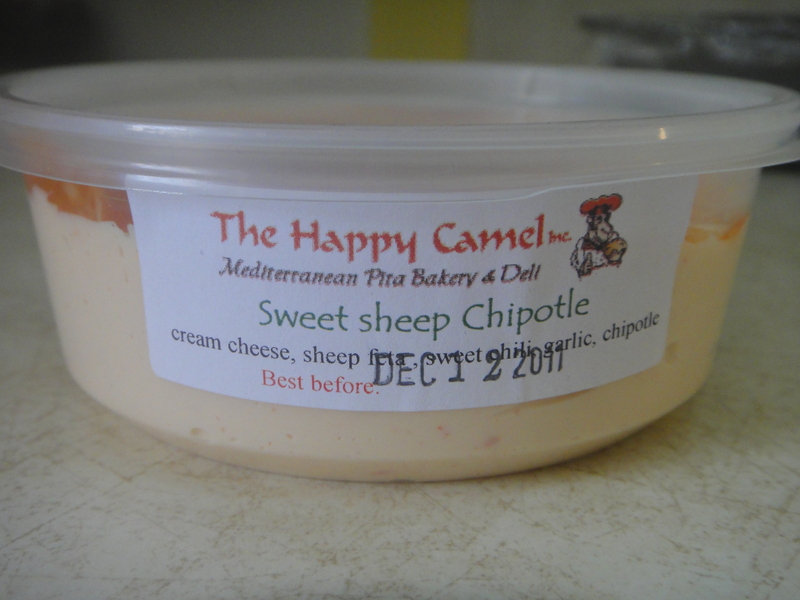 We ate ours with a tub of sweet sheep Chipotle dip. This stuff is to DIE for! 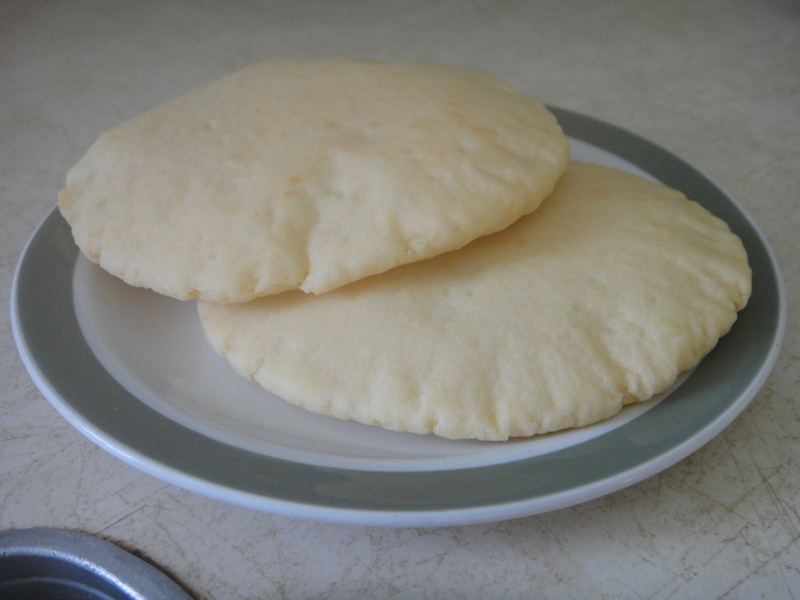 The beauty of these pitas is that they are very quick and easy. If you keep them in the freezer to stay fresh (which they recommend because there are no preservatives in their products – bonus! 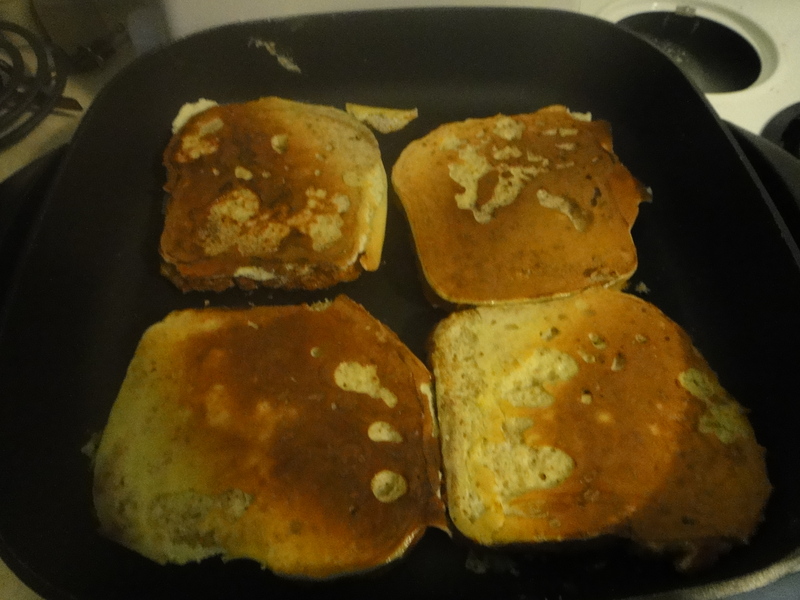 ), all you have to do is pop them in the toaster and they are ready to go! 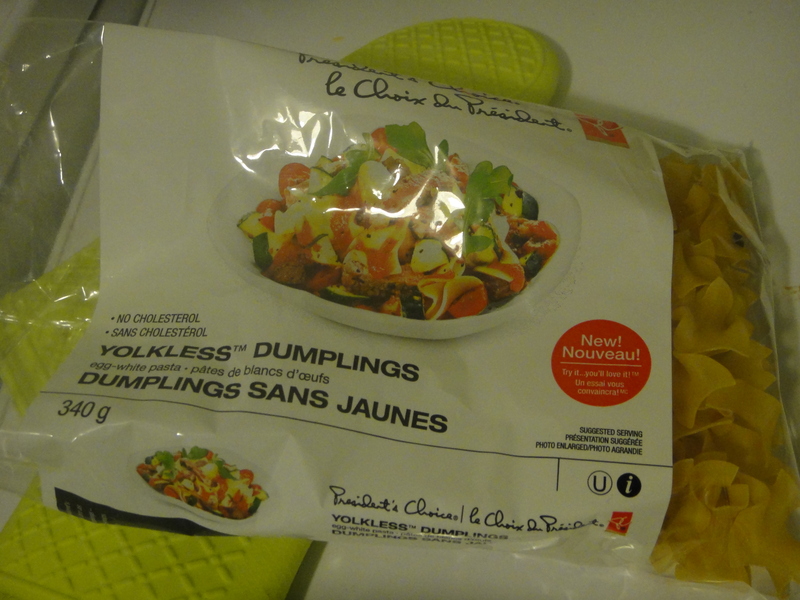 They are selling them at the Old Strathcona Farmer’s market and their shop in the West End. Give them a try, you wont regret it! I love my crockpot. I have made dozens of different dishes in my lovely crockpot, and every time I open the front door to a delicious smelling house, after a hard day of work, I am eternally greatful to the person who invented that rock awesome machine. Here is a new one that I am sure to add to my recipe repertoire. 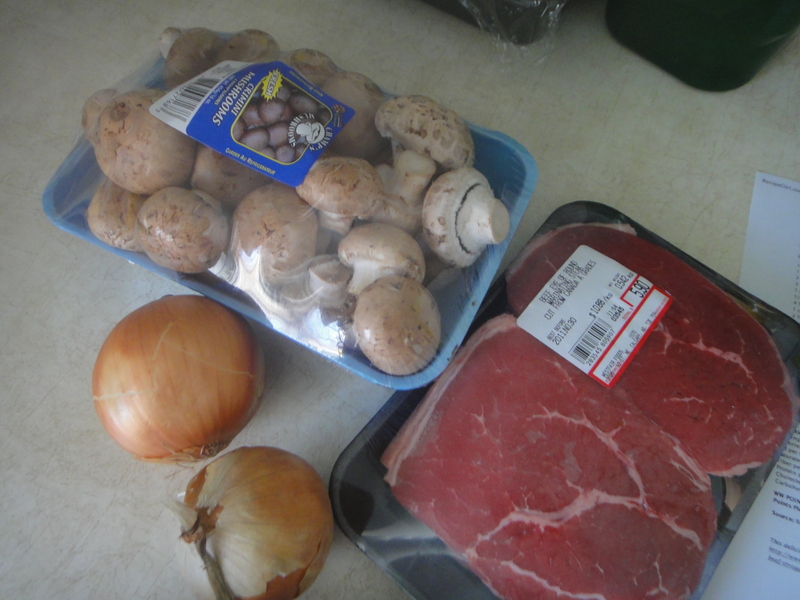 Start with your basic beef stroganoff ingredients… Beef, cremini muchrooms, and 2 delicious onions. 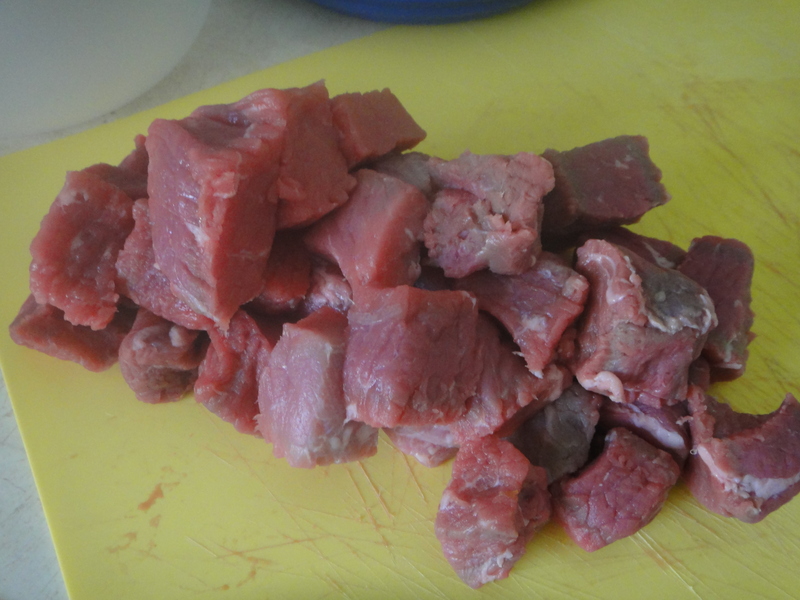 Chop up the beef in to cubes. 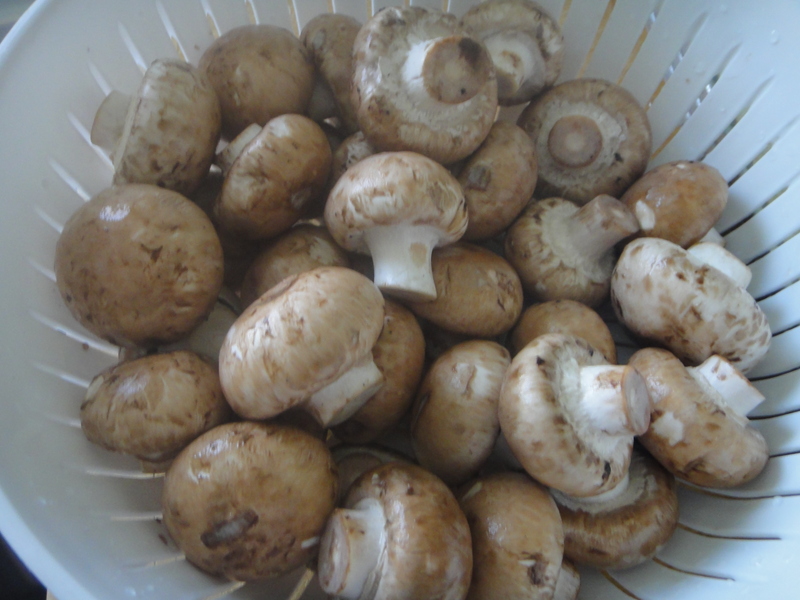 Wash the mushrooms and dice the onions. 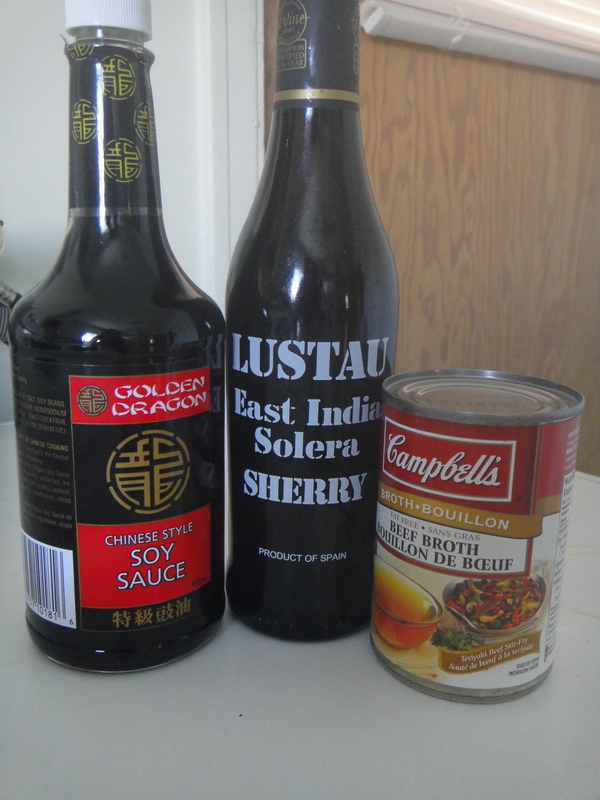 Combine the soy sauce, beef broth and sherry (I used this instead of wine). 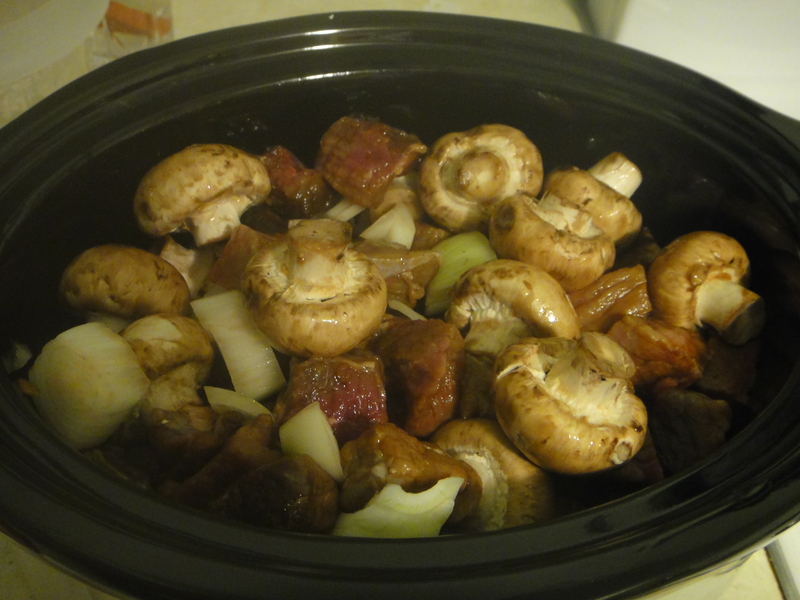 Place all of the ingredients in the crockpot and cook on low for 7 hrs. After it’s done cooking for 7 hrs, mix together the sour cream and corn starch. 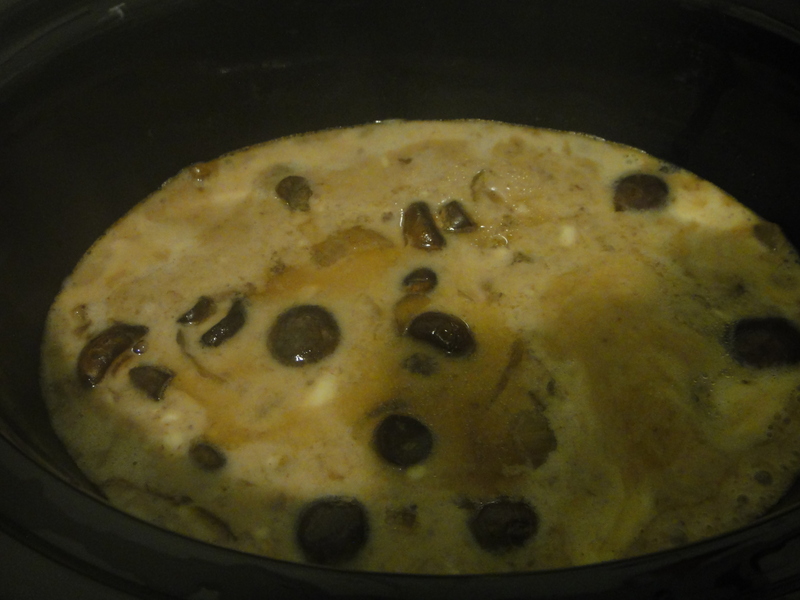 Add to the crockpot, turn it on high and cook for another half hour, or until slightly thick. 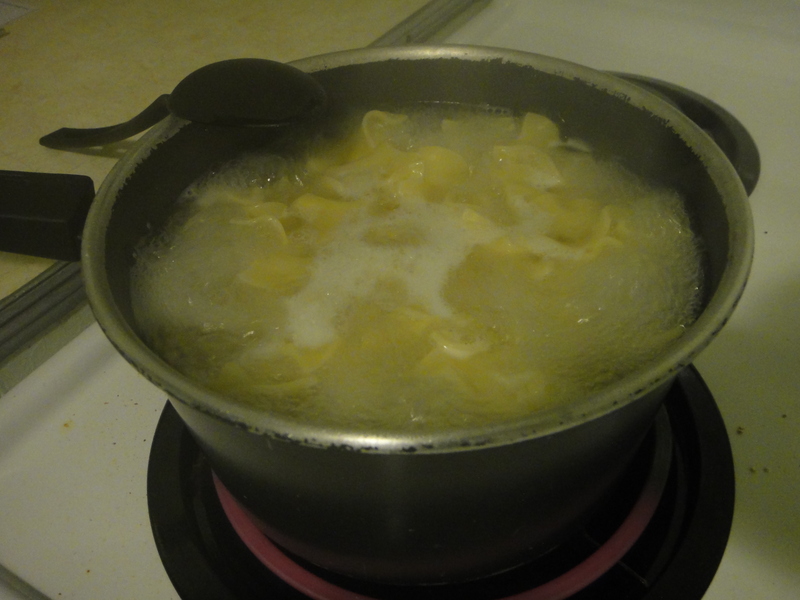 While your stroganoff is thickening, cook up some egg noodles. 1. 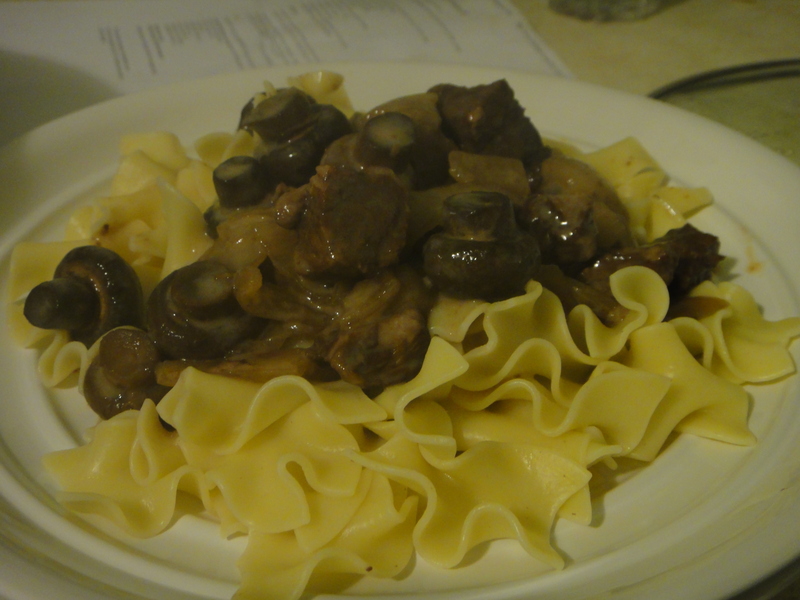 Combine beef, mushrooms, onions, tomato paste, broth, sherry and 3 Tablespoons soy sauce in the bowl of a slow cooker. Cover and cook on HIGH for 4 hours or on LOW for 6 hours, or until beef is tender. 2. In a small bowl, stir together sour cream, remaining 1 Tablespoon soy sauce, cornstarch and black pepper; whisk into the hot meat mixture and cook an additional 30 minutes or until sauce has thickened slightly. Serve over pasta or rice and garnish with parsley, if using. ‘Tis the season for tasty treats! I love weekend mornings where I have time to make delicious breakfasts. 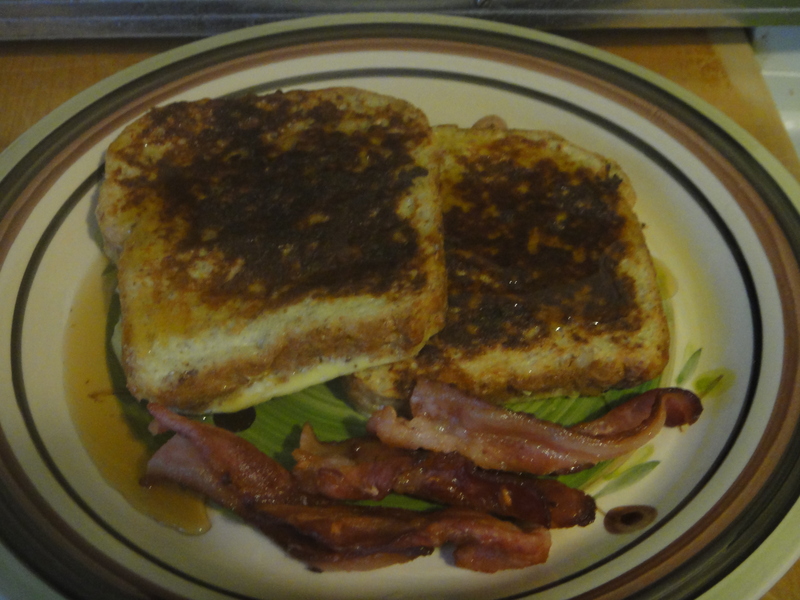 This past weekend was Eggnog French Toast! Justin is the biggest Eggnog fan. When it started to appear on shelves in mid-November, he went out and bought two, right away. 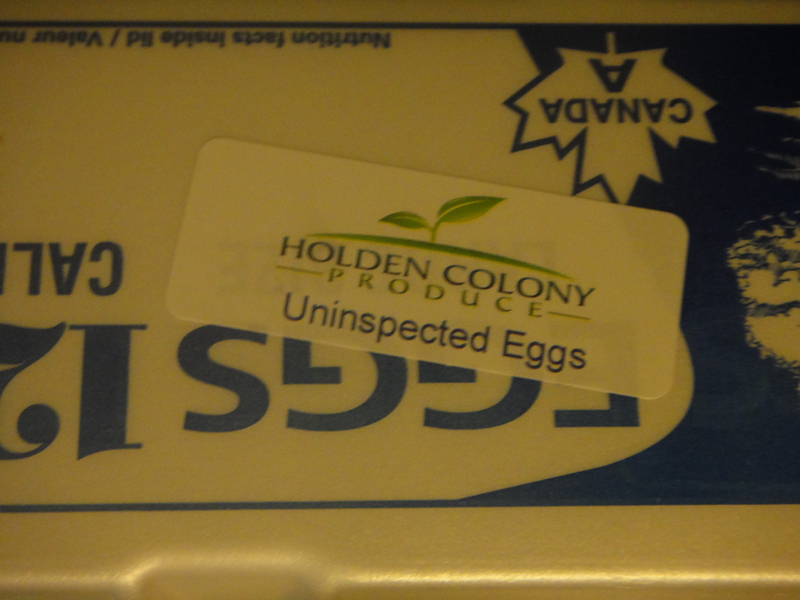 For this recipe, I used local free range eggs from the Holden Colony, who has a booth at the Old Strathcona Farmer’s market. 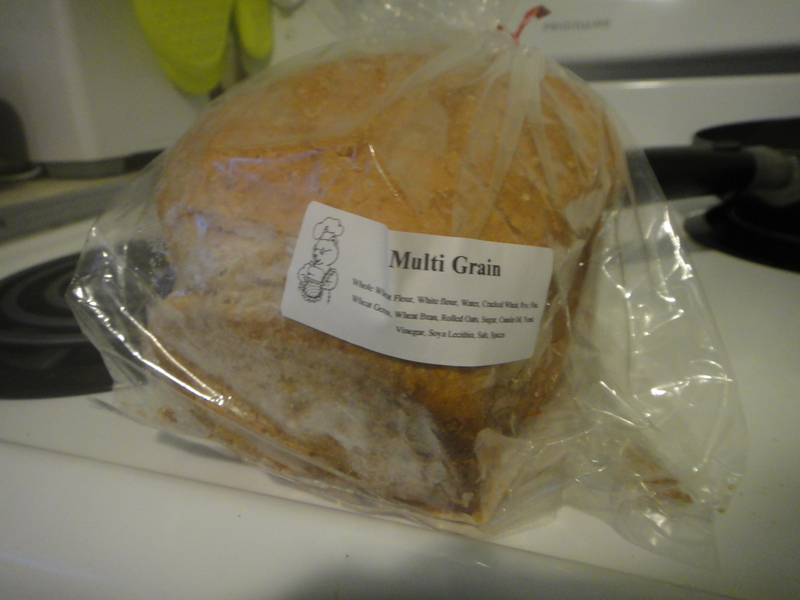 I also used multi-grain bread from Grand-ma bear’s bakery, also at old Strathcona. 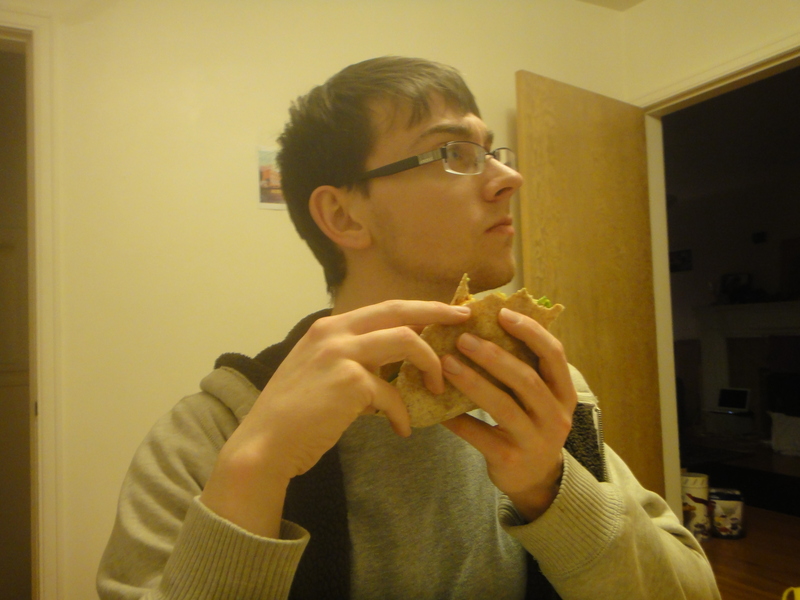 Tasty bread there, and the most reasonably priced! Look at that golden brown goodness! Smother with maple syrup and a side of bacon. Delicious! 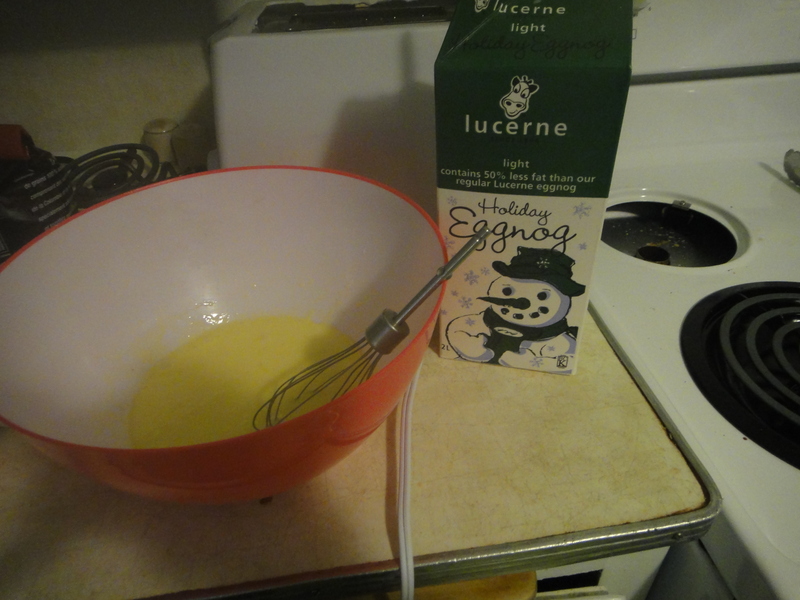 Combine eggs, eggnog and cinnamon well. 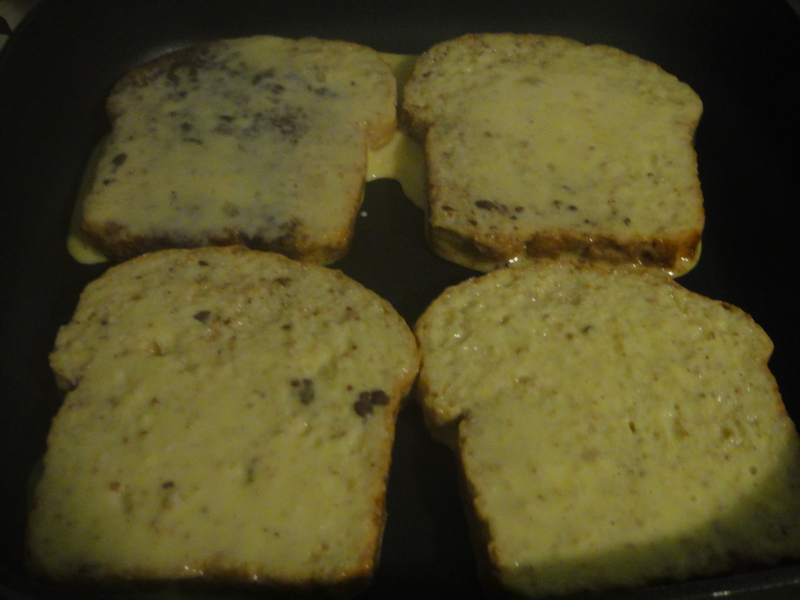 Soak toast in mixture until it is soaked through. Using a non-stick skillet, fry up toast until golden brown. Cook bacon to your liking and serve on the side. Enjoy, a lot!